Djrobblog.com – Page 321 – Music Blogging for Serious Fans! Lately, I’ve been amazed at the number of Baby Boomer recording stars who continue to tour and release albums, and do so with astounding success. In a future article, I’ll probably write about the convincing number of 50-plus-year-olds who’ve topped the Billboard charts during this decade, or who’ve put on highly lucrative worldwide tours with performances that sometimes make you forget just how old the artists really are. Think Springsteen, Streisand, Petty and, of course, the Stones – all of whom have either had chart-topping albums or record-smashing tours of late, and you’ll get an idea of who might be included in such an article. Another such ageless wonder is pop legend Madonna, who I had the opportunity to see perform during her Rebel Heart tour stop here in Chicago recently. Madonna is one of those must-see bucket list artists for a music blogger like myself, so when a good friend of mine here told me she was going to be at United Center, I couldn’t pass it up. Now, as someone who has always been a fan of the artist, with many of her singles, albums and CDs in my collection, I’m admittedly late to the party when it comes to having experienced her live in concert. So I wasn’t quite sure what to expect from this legendary performer who, 33 years into her successful career, I believed to be well past her prime (which isn’t an insult when considering how ginormous her prime was during the 1980s and ’90s – it would be nearly impossible for anyone to sustain that level of success). 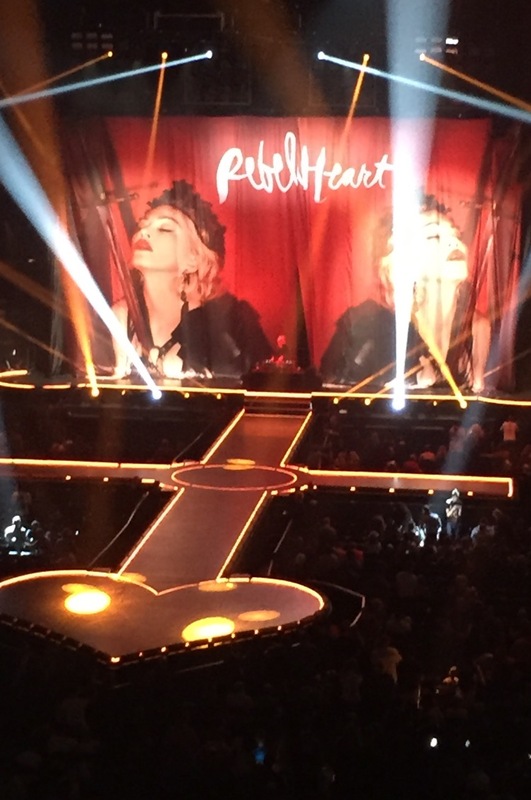 A national DJ serves as the opening act while fans await the main attraction at Madonna’s Rebel Heart show. But after only a few minutes into the show, it became very clear why tens of thousands of worshipping fans still clamor to see Ms. Ciccone perform more than three decades after her first hit, “Burning Up,” which she performed, was burning up dance floors. Her show was simply amazing to see! Nevermind the fact that I was now only familiar with about half of the songs on the show’s set list, which consisted of a healthy dose of tunes from her latest album, Rebel Heart. Or that even the familiar old songs were given new musical arrangements which made them almost hard to recognize, and even harder to sing along to. Imagine the 1987 dance-pop #1 single “Who’s That Girl” reduced to an acoustic ballad and you’ll get the picture. Madonna’s Rebel Heart album stopped just shy of becoming her 9th #1 album in the U.S., when it debuted and peaked at #2 this past spring. But after realizing that five of the first six songs she performed were from Rebel Heart, I quickly resigned myself to the fact that this was more a showcase for her newer material than it was a trip down memory lane for us older followers. Overall, she performed ten songs from that latest release. However, even I am aware enough to know that with Madonna’s shows, it’s not necessarily or exclusively about the song choices or their musical arrangements. Madonna is and always has been a visual artist, and this show was no exception. On this particular day, hers was the kind of performance that had many cell phone cameras capturing lengthy moments throughout the night. Whether it was the trapeze artists/dancers standing precariously on 20-ft poles that jetted from the floor and swayed wildly in all directions on the extended, cross and heart-shaped stage, or the army of dancers whose job it was to keep us (and Madonna) entertained while bringing new life to the songs that Madge’s aging vocals otherwise couldn’t, this show was as much or more about the visual effects than it was the audio ones. 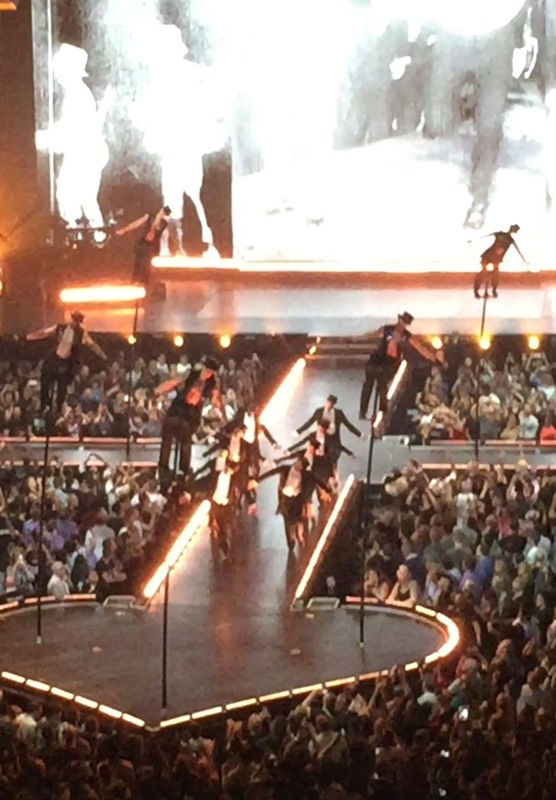 Madonna and her dancers performing acrobatics while a video plays in the background at her Rebel Heart stop in Chicago on 9/28/15. Take the stage itself, whose pendulum-like arm with the heart at the end projected more than halfway across the arena floor, complete with floor risers and openings to allow the acrobatic dancers to appear from almost anywhere at a moment’s notice to work their magic. And that’s not to mention the awe-inspiring video effects, which appeared both on large screens and throughout the stage to further enhance the visual experience. All of it was a not-so-subtle reminder that Madonna demands nothing but top-of-the-line quality for her performances, and that’s exactly what we all got. But these effects were also very necessary, particularly since it’s well known that Madonna’s vocals, especially the 57-year-old variety, would not likely carry an entire two-hour show…a show whose energetic (and requisite) dance routines would challenge the vocals of even the strongest singers out there. Not that this mattered much to the 40,000 or so devotees who were in attendance to see one of the greatest performing legends of all time, and who pretty much knew what to expect when they got there. And believe me, this crowd represented people from nearly every walk of life, including a very tall, cross-dressing, Britney Spears lookalike who elicited a funny “been there, done that” line from Madonna when the wedding-gown wearing man offered to kiss the singer during a brief interlude after the guest was invited onstage. Madonna’s comment was a reference to the infamous on-stage kiss that she and the real-life Britney Spears shared at an MTV Video Awards show many moons ago. I guess this type of interplay was something else a Madonna concert rookie like me could have expected. But it was never clear to me whether this moment was impromptu or staged, particularly since I had seen this tall wedding-dress wearing character sashaying across the floor seats earlier in the event. But back to Madonna and her multi-faceted performance for a moment. I don’t believe any of those wide-ranging fans in attendance were deluded enough to rank her singing skills, either today’s or those of 30 years ago, at or near the top of any greatest-singer lists. However, her talents as an overall performer certainly rank way up there, as one would be hard-pressed to find a living artist, male or female, as internationally successful or entertaining as the arguable Queen of Pop. And no one obtains that status by accident or by being devoid of the many talents Madonna indeed possesses. 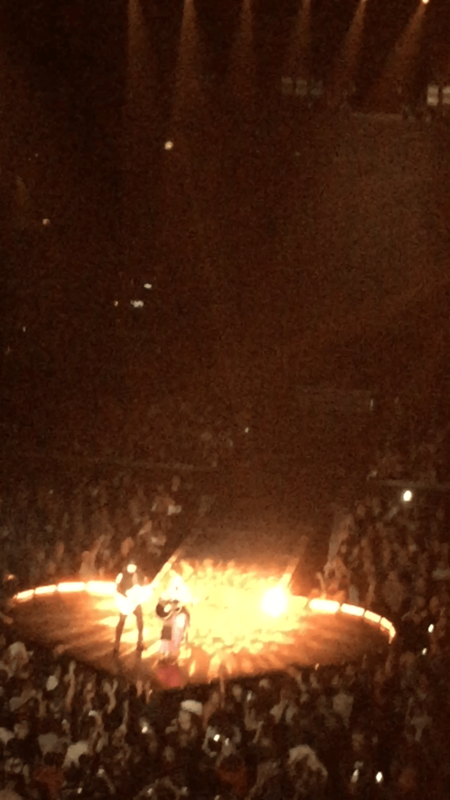 Madonna plays acoustic guitar during her performance of “Who’s That Girl” and “Ghosttown” at Chicago’s United Center. Perhaps playing the guitar is a hidden skill her most die-hard fans have known about for eons, but for me, it was the very first time seeing it. And it further entrenched Madonna at the top of my “never-ceases-to-surprise-me” list. Sadly (for me at least), the superstar did not perform some of my favorites, including classics like “Like A Prayer,” Cherish,” “Live To Tell” or “Borderline.” But, all-in-all, seeing Madonna’s Rebel Heart performance was a very satisfying experience.